"I will pray, talk about trafficking and keep my eyes open." A Sister who attended CoR’s anti-trafficking meeting in Manchester in January, organised a follow up awareness raising day at a prayer centre in Formby, in northwest England. Religious, Priests and lay people from across the region attended, as well as retired Archbishop Michael Fitzgerald, who returned to England in the autumn to join his congregation, the Missionaries of Africa or White Fathers, on the opening of their new community in Liverpool. The day in Formby involved two of the speakers from the Manchester meeting giving presentations again – Brother Francis Patterson of the Medaille Trust and veteran anti-trafficking campaigner, Sr Isabel Kelly; they were joined by Anthony Brown of Caritas in the Diocese of Salford. Seven of the properties the Medaille Trust houses people in were given by congregations. The scale of involvement by Religious in anti-trafficking was recently revealed in a report by the Arise Foundation. It showed that a total of 29 properties have been donated at a value of well over sixteen million pounds and that 172 members of Religious institutes are involved in frontline services. Brother Francis outlined the Medaille Trust’s focus on the four ‘Ps’ : Prevention, Protection, Prosecution and Partnerships. He explained how the National Referral Mechanism offers government funding for the victims of modern slavery for 45 days – but that rehabilitation of victims can take years. He recalled the words of Cardinal Turkson at the launch of the Arise report in November : that this issue is not just one of concern for Religious, but it needs to be something we all feel a responsibility to tackle. Sr Isabel Kelly FMSJ then spoke movingly about the plight of victims. A long time and hugely dedicated campaigner against trafficking, Sr Isabel explained how she developed her knowledge of the issue after the shock of being named as her congregation’s lead on it. She never misses an opportunity to speak out and is in great demand to give talks to parishes and groups. For instance, going out on the bus that has been turned into an awareness raiser for anti trafficking (it used to be the ‘mercy’ bus during the Year of Mercy)! Caritas Anti-Trafficking models itself off this parish group, linking more widely with Greater Manchester Police, the Medaille Trust and the Santa Marta Group in Westminster. It networks widely with charities and groups interested in tackling modern day slavery and raises awareness within parishes and schools and with groups of interested or concerned adults. It also offers advice, signposting and pastoral support to victims. One attendee suggested developing a northwest coastal link up, to join forces in efforts to raise awareness. The Conference of Religious greatly welcomed the initiative of organising this type of local meeting, in response to the large anti-trafficking gatherings held in January and will offer support to other congregations who would also like to host such an event. 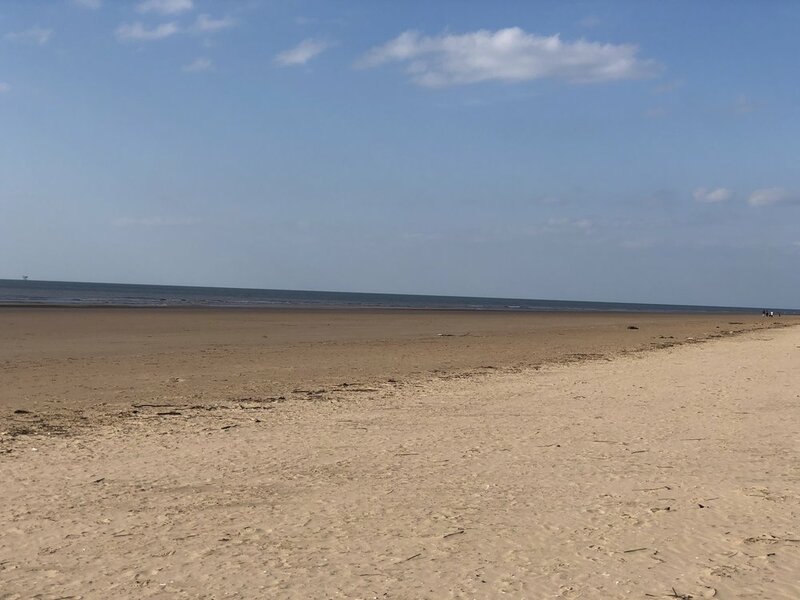 Formby organiser Sr Nora Coughlan SMG expressed delight that so many had attended and expressed the hope that what was discussed in Formby would be like a ripple effect spreading out, touching more and more people. ‘And then the beating began.’ The first words that burst forth, uninvited from ‘Freddie lips when I met him on a glorious February afternoon a few weeks ago. I had dropped into the Medaille Safe House to deliver clothes donations from my some people in my local parish. Clearly in need of a listening ear, Freddie approached me. Bearing his untouched cup of coffee in his hands, he recounted without bitterness how ‘his friends’ had said they were offering him a job and a better life in the U.K Now he was trapped in the back of a van, robbed of his passport and documents and suffering the pain and humiliation of torture all the way ‘to the promised land.’ Five years of abuse followed where he worked as a cleaner, gardener and car wash attendant. There he suffered the degradation of sleeping on the car wash floor until rescued by the police and brought to a place of safety and rehabilitation. Freddie is 33 years old. My thoughts immediately drew a comparison to the passion of Christ. Jesus had been betrayed and sold by ‘his friends’ and tortured all the way to His innocent death. On occasion, I am one of those ‘friends’ who still betray him. There are moments when my thoughts or actions do not reflect a knowledge of or relationship with the living Lord. My indifference to the suffering of humanity transports Jesus all the way to the cross and moments of un-forgiveness pass one more sponge of vinegar to His parched lips. Fortunately for Freddie, a rescuer appeared and Freddie had the courage and grace to enter into His rehabilitation programme. He now shares his story of recovery to offer hope to others. I too have been blessed on the many occasions when I have known the healing, forgiving and redemptive love of the Lord. A joy to be shared with all people.